This post has 3 views. This post has 749 views. This post has 2,912 views. I hope everybody had a great Thanksgiving. I sure enjoyed my four-day Thanksgiving break. I didn’t travel anywhere, but I didn’t do any work on Thanksgiving and Black Friday and I enjoyed that a lot. Like previous years, I went to my aunt’s place for Thanksgiving dinner, and as always there was a mountain of delicious food that cannot be finished even though there were a lot of people. It was also nice to catch up with relative and acquaintances at the dinner. Unlike previous years though, I didn’t make the midnight trip to the clothing outlets. I didn’t have any clothing items I wanted to buy, and I find extra sleep very valuable these days. Instead, I spent mostly on electronic items these days, both for myself and for my parents. I bought most of the items online, but I did go out both on Thanksgiving night and Black Friday to shop. The so-called Black Friday sales seem to start earlier every single year, and this year a bunch of the big name retailer opened their doors at 6 PM on Thanksgiving… the exact time when people usually start eating turkey. The online sales were even earlier and some started at midnight on Black Friday. I think they might as well call the whole thing the Thanksgiving sale from now on. Most of the really popular doorbuster items, like the iPads, were quickly sold out online or in store. I visited a Best Buy after Thanksgiving dinner at around 9:30 PM. The store was crowded, but there wasn’t a line up to get in because most of the really sought-after items were long gone. Luckily for me, there were still a couple of those $100 24″ Dell LCD monitors, so I quickly bought one. LCDs have really fallen in price over the years. I remember when I was in high school, my family bought a 17″ no-name LCD for $500 and it was considered cheap at the time. That LCD monitor actually broke and I had to fix it myself. Now 24″ 1080p screens from reputable brands can be found near $100 which I find amazing. It also makes me feel old . Anyways, below is a mini first-impressions on my new monitor. This post has 6,991 views. One thing that I lugged back from home on my journey back to school was a set of new speakers. The model is a set of Corsair’s Gaming Audio Series SP2500 2.1 speakers. From what I’ve read online, these are very nice as far as 2.1 computer speaker sets go, and with a price tag of around $200, they’d better be. 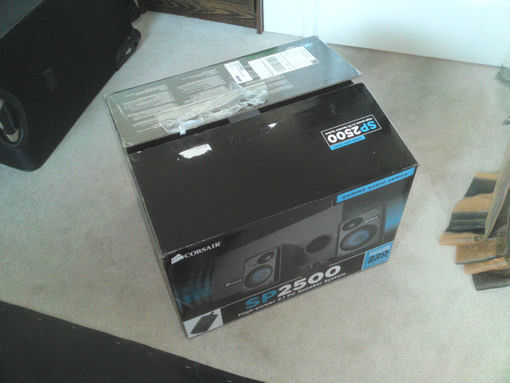 Luckily for me, I didn’t pay for the speakers; I won these speakers from a contest, which is of course awesome. My parents had no use for it, so I decided to lug it all the way from Vancouver to my rented apartment… to connect them to the TV and use them as “home theater” speakers instead. I have a laptop and I don’t really play games these days, so the speakers are only probably going to be used for watching movies, and I like to watch movies with the larger screen of the TV. This is not the SP2500’s intended purpose, but you make do with what you have. Anyways, this is a post just to show some photos of my new speakers and write some initial thoughts. I don’t think I’m qualified to write a actual review for these speakers or any sort of audio equipment. As always, please excuse my crummy photos. I only have a not very new cellphone as my camera. The SP2500 came in quite a large box. This post has 7,865 views. First post of 2011! I hope all of you had a happy new year. For this year’s first post, here is another article documenting my attempt to repair electronics, and this time it’s for the video card of the six year old Athlon XP PC that I built myself. Similar to my last repair article about LCD monitors, the video card was also afflicted by the capacitor plague, and thus I had to get out my soldering iron once again and replace some capacitors. I’m no expert at repairing electronics, so this just goes to show what you can do with a little bit of research, some inexpensive equipment, and the courage to try. This post has 11,419 views. Since I left home to study abroad, I no longer had access to my old Athlon XP desktop and had to buy a new computer. I decided I would get a laptop since it just more sense to have something smaller and portable. In the end, I shelled out for a ThinkPad, which are all-business, rock solid machines with good build quality, and this post is just for showing some photos and thoughts on my new computer. 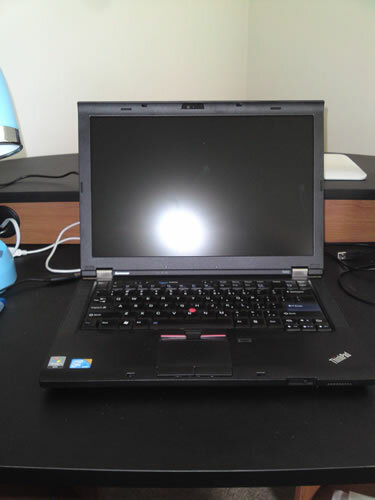 The T410 opened and ready to work. This post has 18,711 views. Yesterday I fixed an old broken LCD monitor and I thought I’d share the experience. Specifically, I replaced a bad capacitor on the LCD’s inverter board to fix the problem of the back light not lighting up. Repairing a LCD… sounds impressive right? Yeah, I’m proud of myself right now , but it’s actually a really easy job if you have a soldering iron. I have really shaky hands and if I can do this, then so can most of you. This article is part guide and part personal experience. You’ll have to excuse my blurry photos though. Read on if you are interesting or if your monitor is afflicted with a similar problem. This post has 10,986 views. I haven’t made a computer hardware post for a while, mostly because I didn’t buy anything significant until this month. As the title indicates, I bought a Seagate FreeAgent GoFlex 500GB portable hard drive. As with all of my hardware posts, this is not a review. It’s just a chance for me to show off my new gadget and write some thoughts on it. Read on if you are interested. This post has 5,548 views. Last Christmas I decided to give a little gift to myself, and so I went out and bought a Wacom Bamboo Fun graphics tablet. I’ve been eying a graphics tablet for a while, but I waited until the Boxing Day Sale to pull the trigger. Here is my experience thus far with the product, and a teaser of what I might be capable of producing with my new tablet. This post has 8,531 views. It’s been almost four years since my family has gotten a new computer. Usually I’m the one who gets the fastest computer in the house, but this time around the new computer is for my dad. 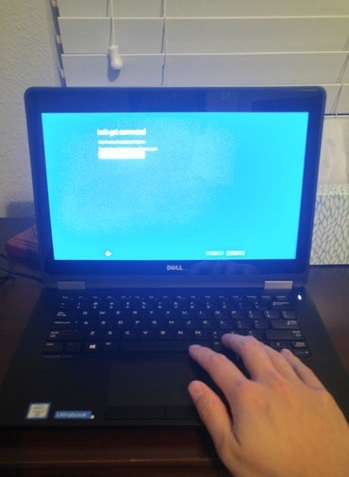 The old computer that he was using was getting unbearably slow even for web surfing and word processing, so it was finally time to get him a new computer. After considering all the factors, we decided to get a 17 inch laptop, the Compaq A900 series (model A939CA). 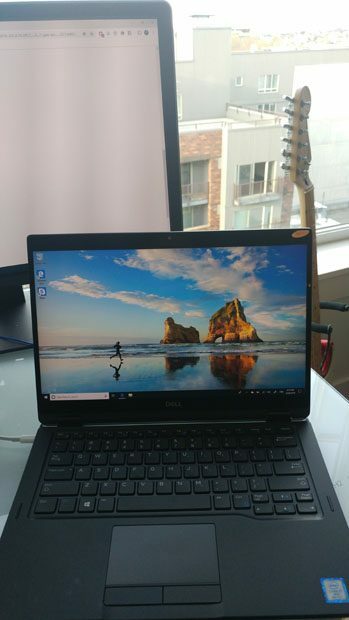 This article is not a really a review of the laptop, but just a short document about setting it up and my first impressions of the laptop (and also Windows Vista), plus a couple of pictures of the machine for people to see.